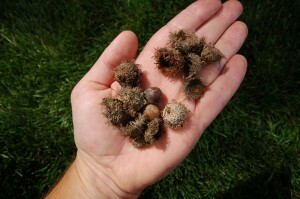 After a few days the squirrels had easily buried hundreds, perhaps thousands, of acorns in a few block radius. Did they really need to bury more? How many could they eat during a given year? How would they find them all? I had heard at one time that squirrels didn’t really know where they had buried all of their acorns but with a combination of their sense of smell and some random luck they would stumble upon one of their previously buried acorns. While it might make for a good story it turns out to be a myth. According to UC Berkley researcher Dr. Pierre Lavenex the gray squirrel, like most animals, uses landmarks to calculate hundreds of triangulations to pinpoint the location of the buried acorns. This is important because these acorns are going to be the food source he will need for his survival through the cold winter. I started thinking about the universality of this lesson for both individuals and businesses; the importance of rigor and planning in planting acorns for your future success (or survival). Do we work as hard as the squirrel in planning for times of scarcity? For many people the satisfaction gained from the immediate reward can prove too tempting. Like the children’s story The Ant and the Grasshopper (one of Aesop’s Fables) it seems far too easy for the grasshopper to dismiss the efforts of the ants gathering food in the summer with “summertime is for play not for work.” Societal trends suggest that we seek immediate reward instead of delaying gratification by saving for tomorrow. We all want the new house, the kitchen remodel, the latest car, the trendy clothes, or expensive electronics. All of these wants seem quite “normal” since this is what we witness everyone else doing. We may be fortunate enough to have the money to buy these things today but do we have our rainy day savings? Worse is when we may not have the money today be we do have access to credit that allows us to get them today and pay for them some time in the future. The challenge comes when tomorrow isn’t like today. When our adjustable mortgage rate doubles, when our bank freezes our access to credit or we lose our job and can no longer afford to make those payments. While consumers have cut back somewhat on credit card use recently it is still staggering the amount of debt we hold. In the Unites States, 46.7% of households have credit card debt and the AVERAGE balance outstanding on those debts is almost $15,000! This leaves an incredible challenge for households with high amounts of debt to pay off current bills let alone save for tomorrow when they are paying 13-14% interest on their debts. In business, it is a little more complicated but follows the same story line. Companies have two ways of burying their acorns to prepare for the future – 1) by hording cash or 2) by investing in a sufficient amount of growth opportunities. In good times most companies will follow both strategies by shoring up the cash position on their balance sheets and by making investments in R&D, equipment, or people to grow their companies. The challenge comes when times turn rough. Most companies will attempt to weather the storm by relying on their cash reserves to pay their bills while operating profits sag. They may extend the length of time that they can sustain this practice by reducing their expenses quickly, which usually includes cancelling any non-essential projects and laying off employees. On the other side companies are quick to stop burying acorns by cancelling orders for equipment and cutting their R&D budgets. In the case of one of my recent employers they had scrapped the entire R&D program. Instead of filling their innovation pipeline with potential opportunities where they can continue to grow their company with new products, services, or categories they have opted to horde their cash and make more limited investments in fewer near term projects. The challenge comes in when you have few growth opportunities in the pipeline and you begin to deplete your cash position you are left with no other options than to dramatically restructure your organization. How many growth projects (acorns) does your organization have buried? How deep and broad is your innovation pipeline? Are those innovation/growth projects at varying stages of development with some near term and some longer term? Does your organization have a strong enough cash position so they don’t have to kill investments prematurely? Have you shored up your personal balance sheet with enough cash to weather a long economic downturn? How much of your monthly expenses is paying down debt – credit cards, vehicle loans, second mortgages, or student loans?